The distinguished historian died shortly after completing this sequel to his monumental Enlightenment (2000). 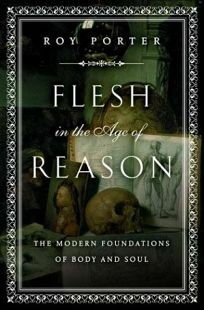 Flesh examines""the triangle of the moral, the material and the medical"" in 18th-century Britain. The Reformation's ouster of church dogma brought with it a wave of speculation about the nature of physical and rational being--most importantly Locke's innovative concept of conscious selfhood that dispensed with the immortal soul. In its place arose a dialectic between internal and external identity that focused on life before rather than after death, a conception of self that has remained a foundation of Western thought. Porter considers the many questions and clashes involved in that conception in what he calls a""gallery of contrasting yet interlocking studies"" divided into sections. The first concentrates on the mental and moral self as advanced by such influential literary figures as Shaftesbury, Swift and Johnson; another takes up the physical and social self in contemporary preoccupations with mortality, health, manners, race and madness. Most of these discussions feature significant contemporary figures, often in unfamiliar guises: Dr. Johnson on depression, Adam Smith on astronomy, Byron on the state of his teeth. Others are memorable but unremembered, like George Cheyne, a proponent of healthy diet whose own weight at one time reached more than 470 pounds. These studies of individuals are augmented with a wealth of information about health trends, child-rearing fads and hygiene scares that bear a remarkable resemblance to our own times. The final section pursues the self into the Romantic era, when social science and poetics""smudged"" the problematic boundaries between inner and outer being with new distinctions between individual and collective experience. Porter's theme is the puritan doctrine of human perfectibility and progressive economic, social and somatic models it spawned. With humor and enthusiasm, he combines a terrific fund of scholarship, canny observation and intelligent synthesis.